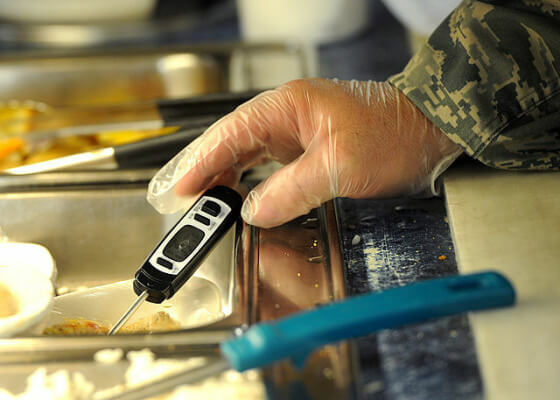 Whether you have taken your MN food safety certification online or in one of our instructor led sessions, you have been told that the best way to ensure that food is cooked to the proper temperature is to use your internal probe thermometer. While your thermometer is one of the most important tools in keeping your food safe, it also poses a great cross contamination risk that could actually lead to foodborne illness. Cross contamination is a constant risk in any kitchen. We have three simple tips to make sure that your probe thermometer is kept safe from this risk. Since your probe thermometer is inserted into every protein, ready-to-eat food and chilled item, it is in constant contact with potential contaminates. Whether it has been inserted into undercooked chicken, soup that is being chilled for storage or hot-held items in you cafeteria, it is vital that it is sanitized after each use. Remember, your thermometer is not clean just because it looks like it is. Our second piece of advice is to always make sure that your probe thermometer is always stored properly. Your thermometer should never be stored loosely on a counter top, in food or in any location where potential contamination may happen. It is also essential to keep your thermometer’s storage sleeve clean. It is possible for bacteria to form in the sleeve and transfer onto the probe when it is not in use. While not necessarily a cross contamination issue, we feel now would be a good time to remind you to check and calibrate your thermometer often. This can be easily done by placing the probe into a large glass of crushed ice and water for one minute. Make sure it is set to 32 degrees. There are small cross contamination risks from utensils in every facility. At Safe Food Training, we would like to keep you fully covered with tips on preventing even the smallest risk. Are there any cross contamination risks in your facility that you feel are being overlooked?